Most days , WordPress puts up a little orange symbol on the top right-hand side of my dashboard. It usually means someone (or even a number of people) have liked something I’ve posted, or people have subscribed to my blog. Occasionally I even get a little reward for having reached some kind of landmark event. Its fun to get, but not a big focus…I like getting comments the most. However, I just got a “Happy Anniversary 5 Year Award” and suddenly that feels like a big deal. 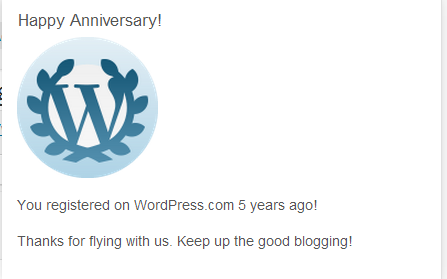 I can hardly believe that I’ve had a blog for that long. Really?! Of course, in the spirit of full disclosure, its not really five years of solid writing. My first blog, Caroline and Carla’s Great Adventure, was started in February 2009, but not much happened until Carla and I set off to walk across England in the Summer. We tried to post on the go, but the internet connectivity and lack of computer access got the better of us many days. However we did manage a couple of dozen posts, which I moved over to this blog in 2010. I blogged sporadically from the Philippines, almost losing it altogether in 2011. But somehow here in Nepal, at least recently, I’ve been on a posting streak and blogging has become a regular activity. Its been an amazing last few years, and there’s been so many new adventures that sometimes I have to pinch myself that I am able to see and do so many interesting new things. The blog has been a wonderful way to record and remember the adventures, and to chart my discovery of new countries that eventually become home. I blog to remember and to share. I prefer to keep it mostly positive and perhaps sometimes that makes my life seems like one long resort visit. It isn’t, of course. Living outside your own culture perpetually is difficult, but I try not to lose sight of the fact that it is also a privilege. ..at least to me. And although its sort of weird at times to put your experiences out there and not know who is reading them, it also is wonderful to hear from people that they love reading the blog. That really keeps me going. So to the few that read this regularly, thanks for the feedback and keep it coming. Now what shall I write about next? ← And the whole reason we went….